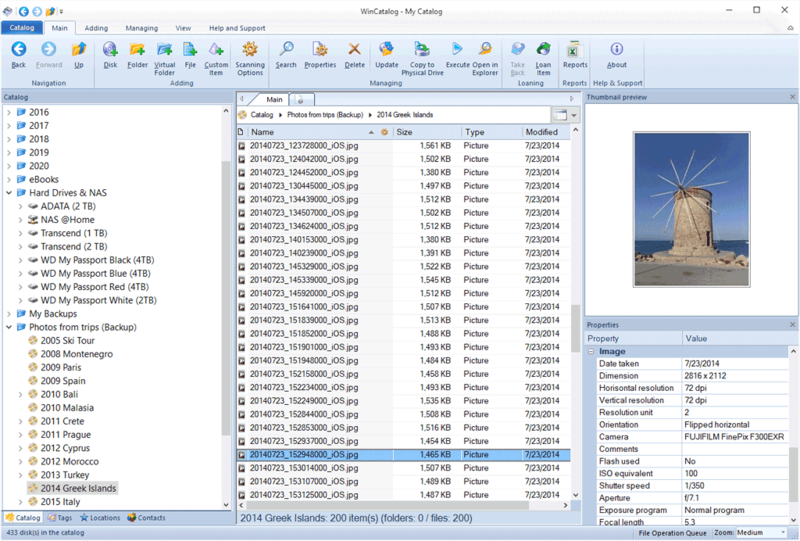 CD Cataloging Software WinCatalog 2018 allows you to automatically create a catalog of CDs and files from your CD catalog: automatically grab ID3-tags for music files, thumbnails and vital info for video files, Exif tags and thumbnails for photos (images), files inside archives, ISO files, and more. Your can organize your CD catalog, using tags (categories) and virtual folders, and find files in seconds without inserting CDs to a computer. Powerful search, including search for duplicate files, will impress you. With WinCatalog 2018 CD Cataloging Software you will handle your CD catalog easily - no matter how big your CD catalog is. WinCatalog CD Cataloging Software scans your CDs, remembers all the folders, files, and some additional info about your files such as ID3 or Exif tags, thumbnails for video files and photos, contents of the archive files and ISO files, parts of text files, tags from saved web pages, etc. The main purpose of WinCatalog CD Cataloging Software is to give an ability to browse and search through your CD catalog even if the original CDs or other kinds of disks and files are off-line. 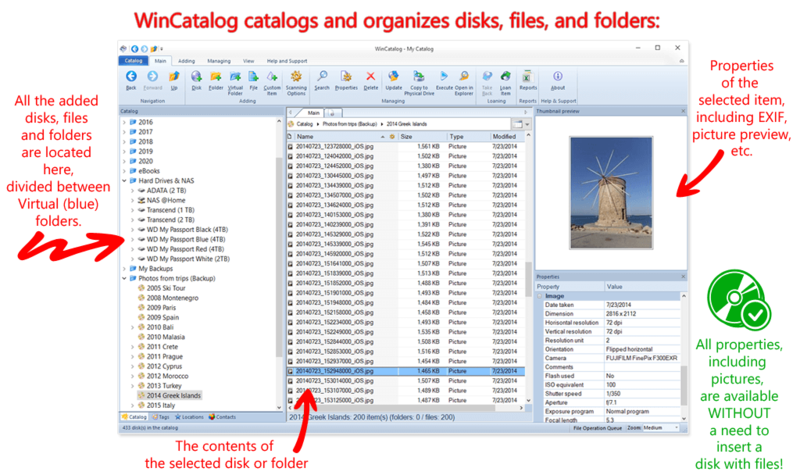 For example, your files can be located on a removable hard drive, on a shared network folder, or burned on a CD, DVD, or a Blu-ray disc and you will still have the ability to find files with WinCatalog CD Cataloging Software and even preview their attributes, including picture thumbnails, before inserting or connecting CD or other disk to the computer. Alternatively (if you do not use WinCatalog CD Cataloging Software), in order to find a file you need to connect CDs or insert media one-by-one to find a specific file. The latest version of CD Cataloging Software WinCatalog 2018 maintains an ability to process ebook metadata for the following file formats: ePub, iBook, Fb2 and Mobi (.epub, .ibook, .fb2, .mobi, .prc, .azw and .azw3 extensions). Also, in the latest version, extracting thumbnails and basic Exif tags from RAW files works up to 3 times faster. Scanning and updating speed for CDs and DVDs has been significantly improved as well, especially for "deep" folders and for folders with a large amount of files. Basically, WinCatalog CD Cataloging Software saves your time and efforts in finding files wherever they are located. Let WinCatalog CD Cataloging Software scan your CDs just once and it will remember all the details! Manage and organize your CD catalog using tags (categories) or virtual folders. Create and assign tags. Browse using the grid or thumbnails view modes. Search through your CD catalog and find exactly what you want by searching using natural search queries, wildcards, or logical search operators.